T3's Laura Mears reports in on the most interesting science stories of the week. For this edition of T3 Science Hit we find out how researchers kill cancer with stars and lasers, SpaceX send ice cream to the ISS and an ancient ancestor is unearthed. Cancer is notorious for its ability to evade treatment, but researchers at Duke University are working on a new weapon. They are tackling cancer with spiky gold nanostars designed to slip through leaky tumour blood vessels. Once there, these microscopic shurikens act as 'lightning rods' for lasers, cooking and killing the cancer cells. "The nanostar spikes work like lightning rods, concentrating the electromagnetic energy at their tips... We've experimented with these gold nanostars to treat tumors before, but we wanted to know if we could also treat tumors we didn't even know were there or tumors that have spread throughout the body." Cancer is most dangerous when it spreads, so the team are combining their nanostars with immunotherapy to mop up any cells that might have moved away from the original tumour. These treatments are designed to switch the immune system on, turning the body's natural defences against any escaped cancer cells. Killing the main tumour lures immune cells in to clean up the damage, and then immunotherapy switches them on, sending them out to hunt any cells that have spread. Or that's the idea. It's still very early days, but they're reporting promising results in mice, including one still going strong nearly a year after treatment. In Nature last week, scientists announced that they'd found a new species that could shed light on the origin of modern apes. This 16-month old ape was discovered in Kenya in 2014, preserved in by an ancient volcanic blast. It's the best example of an extinct ape skull ever found, and an international research team have spent the past three years scanning it for clues about our history. Chimpanzees and humans split apart between six and seven million years ago, so this toddler, nicknamed Alesi, lived well before that evolutionary fork occurred. This period in the fossil record of our ancestors is patchy, so Alesi could help to fill the gaps. A synchrotron in France fired X-rays at the skull, turning up such high-res images of its teeth that the team could pinpoint the infant's age to within a matter of months. But the scientists were most excited about its ears. Although the face of the ape looks a bit like an acrobatic monkey, the inner ear structure suggests that it would not have had the balance to perform aerial antics. 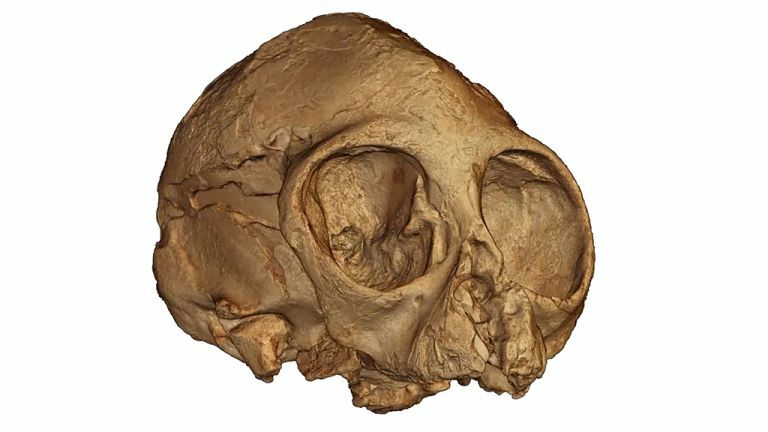 It looks like this skull belonged to an ape related to our less agile ancestors, making it an exciting find in the fossil record of our evolutionary history. Finally, there was good news for the crew of the International Space Station this week with the launch of a payload containing two types of ice cream. The first was the Cosmic Ray Energetics And Mass mission destined for the International Space Station, nicknamed ISS-CREAM, a huge new piece of kit set to examine cosmic rays. The experiment is the size of a fridge and weighs as much as a small car. It’s been up and down on NASA balloons before, collecting information from altitudes of up to 120,000 feet, but in the next few weeks it’ll be unpacked and installed on the Japanese Exposed Facility, where it will start measuring high energy particles from distant space. According to NASA, cosmic rays come in at energies above 1 billion electron volts. When they arrive at ISS-CREAM, their charge will first be logged by a silicon detector and then they'll slam into layers of carbon. This will release what NASA describe as “subatomic shrapnel”, which can be measured by a series of detectors to determine their identity. Out of the confusion of Earth’s atmosphere, the kit should be able to pick up higher energy cosmic rays much more clearly. And, neatly avoiding any ice cream related disappointment, real treats were also packed into the freezers for the August 14th SpaceX launch. The ISS crew should be enjoying chocolate, vanilla and 'birthday cake' flavour desserts very soon.